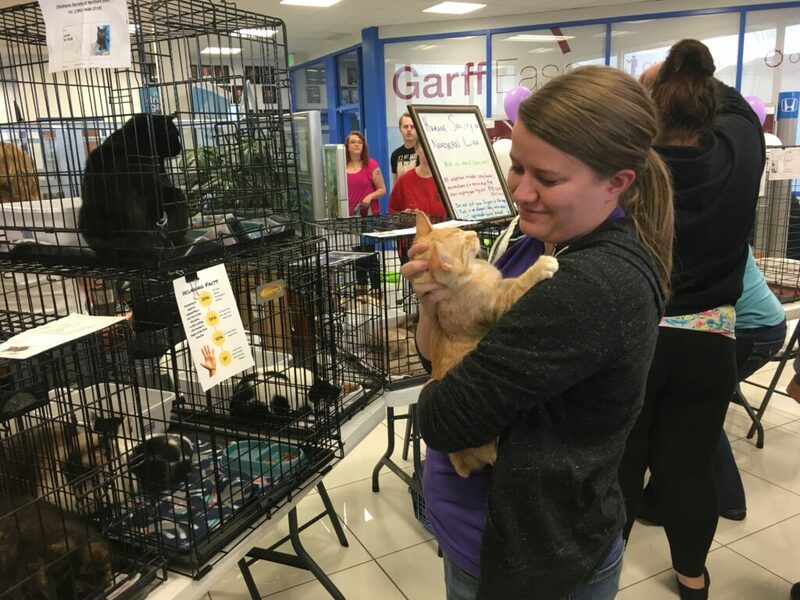 In a partnership with the Northern Utah Humane Society, the Weber State Paw Squad hosted a pet adoption event on April 8 at the Ken Garff Honda dealership in Riverdale, Utah. The Humane Society brought adoptable rabbits, cats and dogs to the event, allowing animals to interact with people in a controlled environment away from a shelter. There was also a live radio broadcast from the event on Utah’s X96. Karen Larsen volunteers with the Humane Society, and she is in charge of keeping records for cats, in terms of their vaccinations and previous adoptions. “The adoption events are the main way we adopt; they’re really helpful,” Larsen said. The adoption went from noon, when the shows began, until 5 p.m., despite hailstorms. Participants entered a raffle and were treated to three individual concerts separated by K9 presentations from the local police force. The Weber State Paw Squad was formed during a class project when the members had to complete a community service project. The group made their plan for the adoption public on April 2, when several members of the organization went on Channel 2 CBS News to discuss adoption and the Humane Society. One member of the Weber State Paw Squad who interacted with the pet adoption attendees was Annika Merritt. As a method of encouraging people to adopt, Merritt walked around carrying Tigger, a four-month old kitten who was up for adoption. Even though the group had the idea to work with animals, they had to hammer out the specifics of a plan. Xequille Harry is another member of the Paw Squad and the class group. He spent most of the adoption sitting toward the front of the adoption area and was in charge of selling raffle tickets. In the end, students and other people who went home with pets found the event rewarding. While the Northern Utah Humane Society said this event was a success, they plan on hosting more in the future in an effort to place these animals in homes.